Slumped posture and rounded shoulders are the result of our sedentary lifestyle with hours spent looking at computer screens. 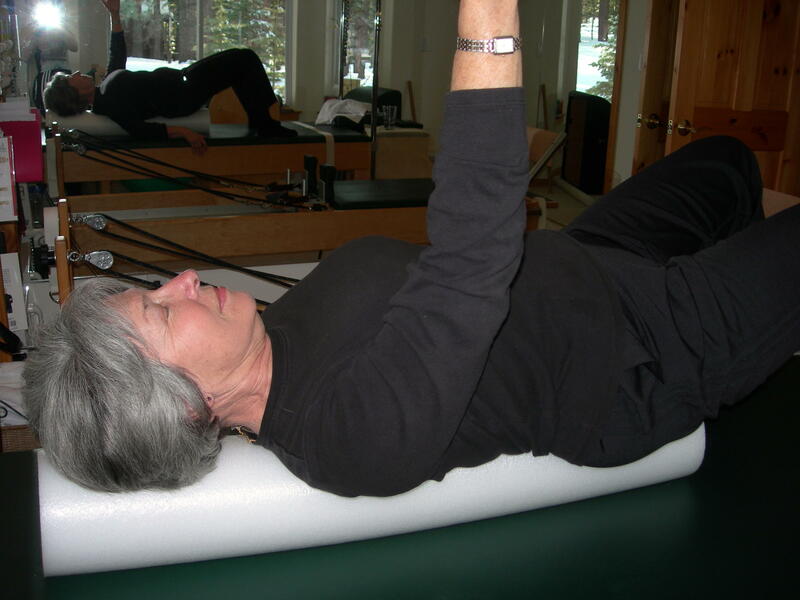 Although there are many components to correcting this multi-faceted dysfunction, passive stretching of the upper thoracic spine can be useful for addressing the pain that occurs mid-back between the shoulder blades. 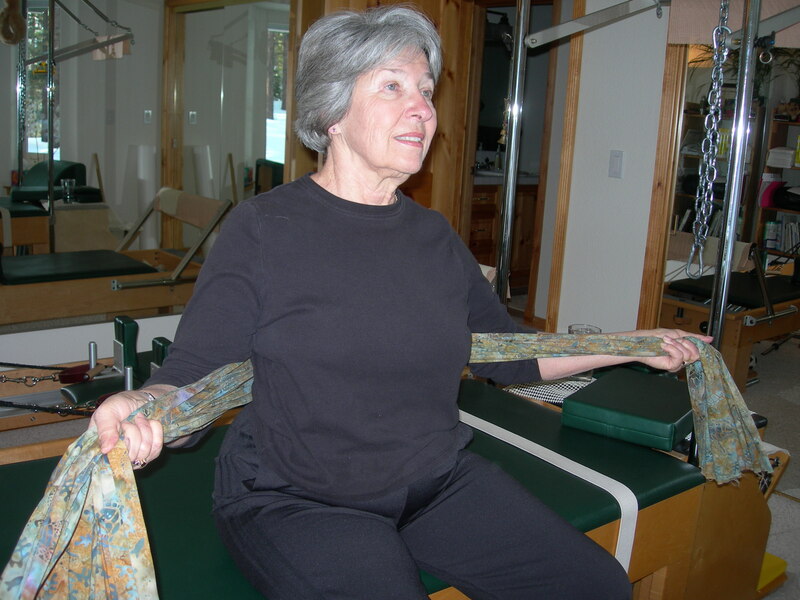 Gravity can do the work for your client along with towels, pillows and supports to open up the thoracic region. 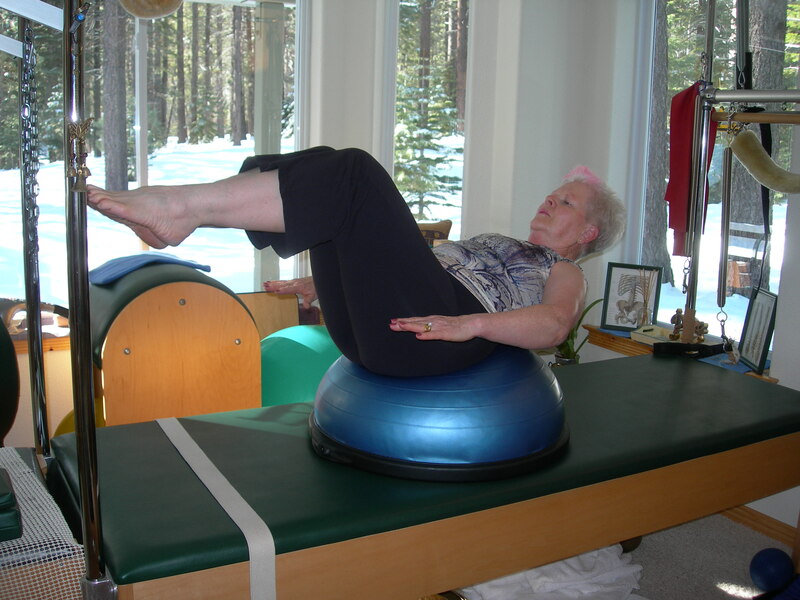 After your client experiences the pleasant and relaxing result of lying supine using this prop arrangement, your client will have a powerful tool to address future discomfort through home care. A slightly posterior thoracic curve is part of a regular healthy spine, but when this curve becomes exaggerated and rounded, called kyphosis, it compresses the chest toward the pelvis reducing space for the organs and can cause back pain, difficulty breathing and nerve irritation. This rounding can occur through consistently slumped posture over time or may be a result of more serious degenerative issues, such as bone fracturing found in osteoporosis. Severe kyphosis may require the use of back braces or even surgery. The following towel technique is only for mild rounding and should be discontinued if any pain occurs. I usually set up the client on the Cadillac, but a mat on the floor will also work. F old the extra large bath towel in half lengthwise and then roll up opposite ends (like 2 tootsie rolls) until one rolls in about 1/3 of the way in and the other side rolls in about 2/3. The rounded ends should meet rolled in together with one side larger creating an evenly sloped angle, rather than two distinct steps of differing heights. This is going to be the main support under the upper thoracic spine, and your client should lie on this towel corresponding approximately to thoracic segments 3-6 with the lower side toward the neck. A good check is to look at the base of the sternum and make sure the towel is situated above the xiphoid process. It is important to place this towel correctly to open the area of sternal concavity found in rounded back posture and to avoid overextension of the lumbar region. 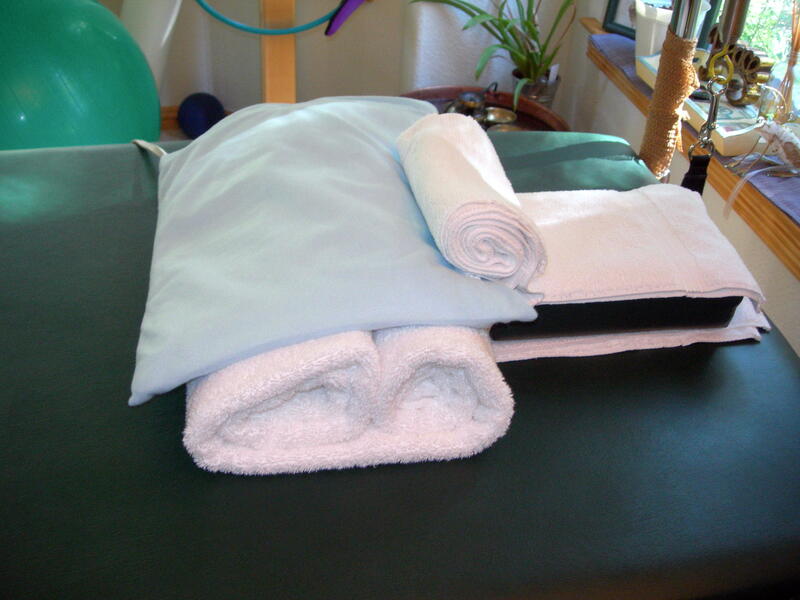 I use a small heating pad over this towel to help relax the back muscles. A pillow should be placed under your client’s head to ensure that the neck is in proper alignment and that the cervical spine does not overextend with the lifting of the chest. The size of the pillow will be determined by the severity of back rounding—the greater the rounding, the bigger the head lift. Any pillow should work, but I like the Balanced Body vinyl head cushions since they come in incremental sizes. The pillow addresses the head height, but does not provide enough cervical support. Fold the hand towel in half lengthwise and then roll it up completely to make a tootsie roll shape. Place this towel under the neck. Be sure you see a gradual descent from the lifted chest to the crown with mild extension of the upper chest to minimize the intensity of holding the position. 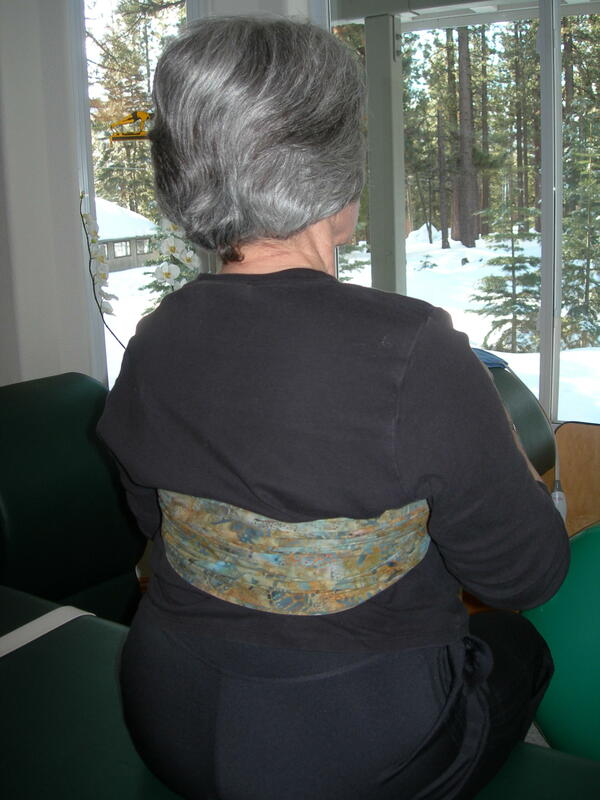 I sometimes also use a heated microwavable neck wrap going from the back of the neck around the shoulders, but the alignment of the chest, neck and head must be maintained. A lavender-scented eye cover is also nice if your client does not suffer from allergies or claustrophobia. 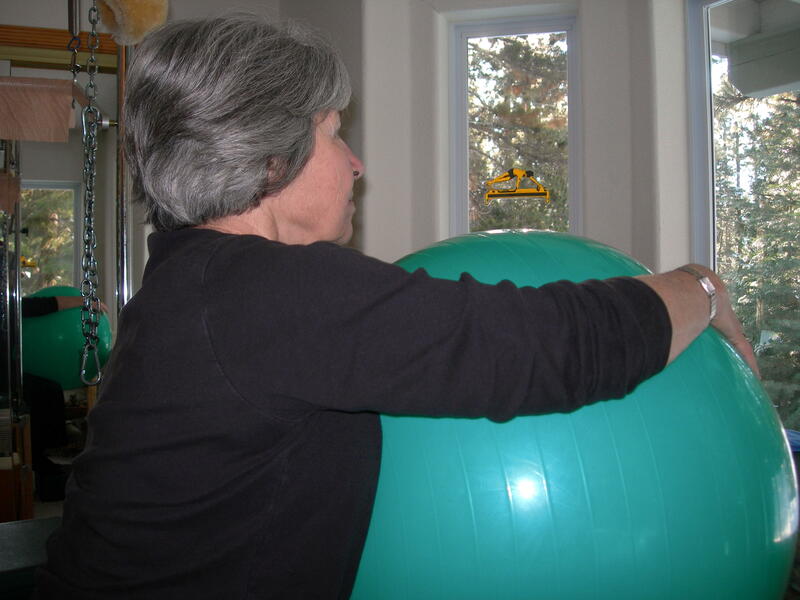 It is important t o elevate your client’s legs to prevent low back pain that could occur from the pressure on the lumbar region in this position. 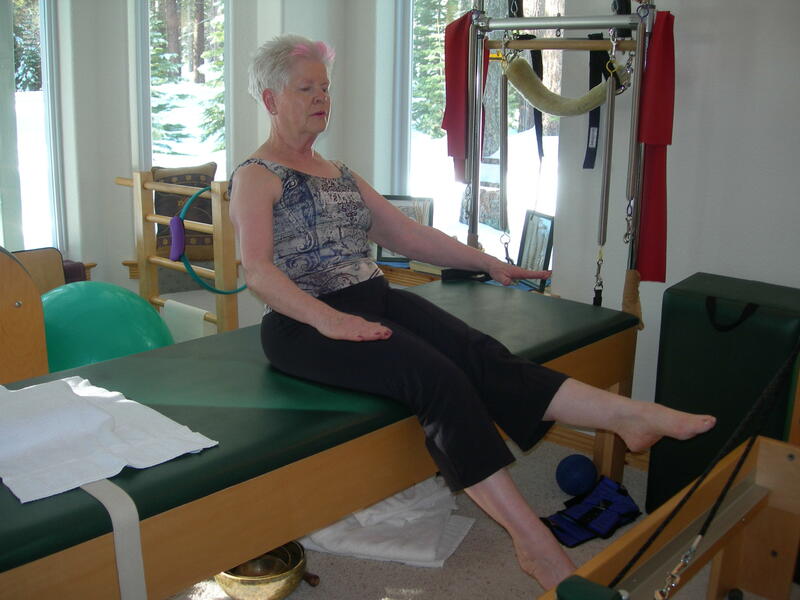 The Reformer Long Box works great for this and should be placed widthwise under your client’s legs comfortably meeting the crease behind the knees. Ask your client what furniture at home might replicate the size of the box (an ottoman, stool, low table or pillows). Make sure your client is comfortable in this position and make any necessary adjustments—use larger or smaller towels, move towel placement, adjust neck support, etc. Advise your client that if the position becomes uncomfortable to inform you as soon as possible. This open supported position is meant to feel good. 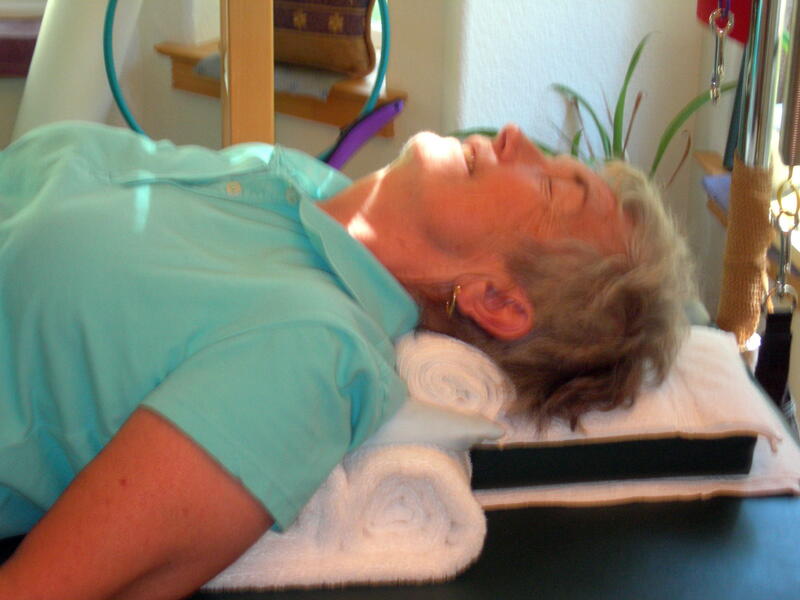 Ask your client to breathe deeply creating a little tension in the back muscles and then relax with each exhalation. When the back starts to relax, normal breathing is resumed. After completing the five-minute period of relaxation, have your client draw both knees into the chest to stretch the low back. When he/she gets up from the table, demonstrate the setup you used, and give any specific instructions related to what you observed to allow your client to replicate the experience at home. Start at home with the same five-minute session and incrementally increase to about 15 minutes provided all goes well. 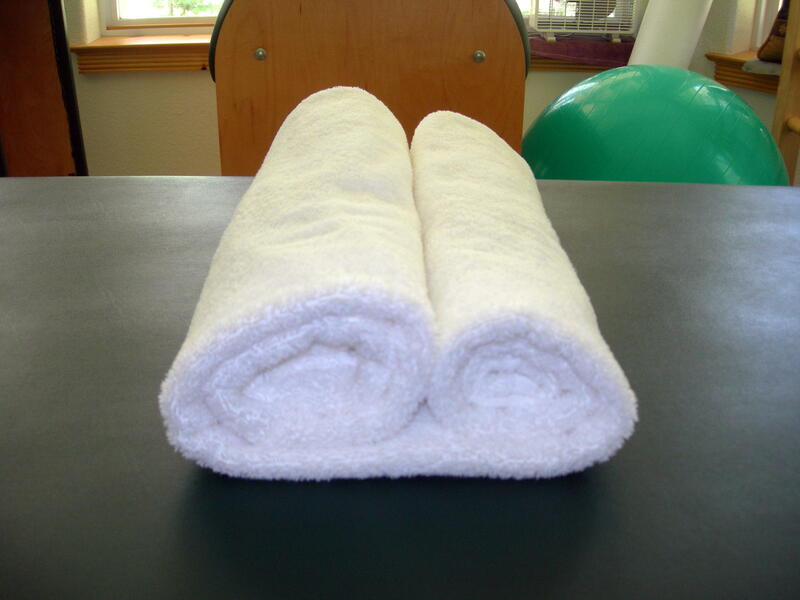 One of my long-time clients uses this towel setup after doing a lot of gardening and housework and says it prevents the muscle tension she used to get after her activities. 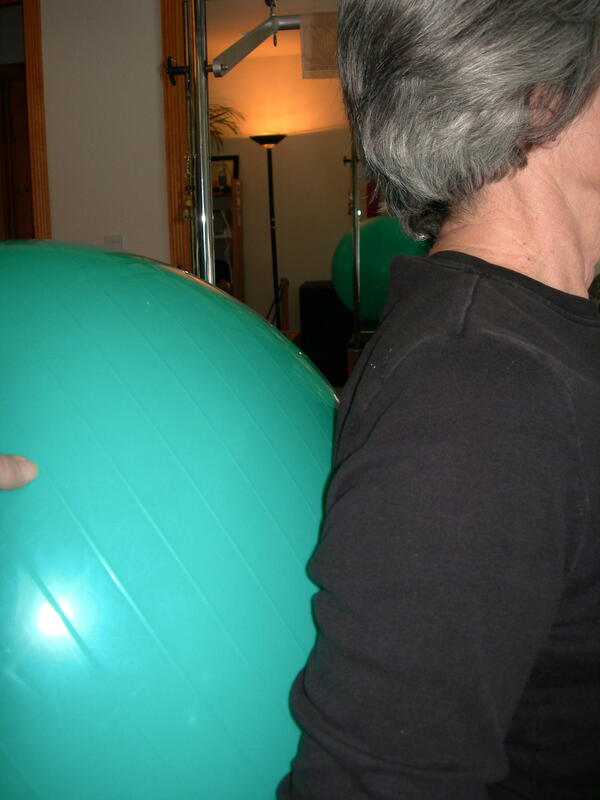 Between regular private sessions and self-care, she no longer has a pronounced rounded upper back. 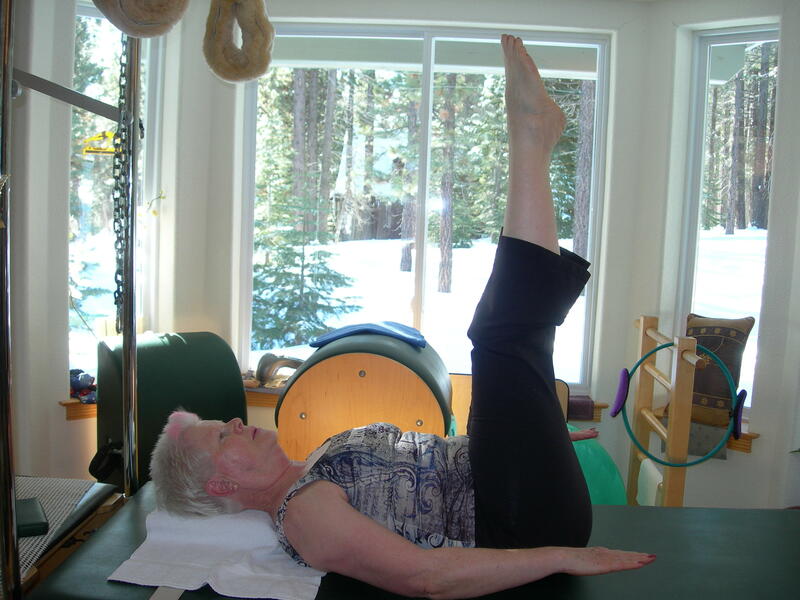 Although a Pilates session for a client with poor posture would include exercises to strengthen the core and back extensors, many clients enjoy spending the last five minutes of a session in a recuperative state. I will often use the towel setup along with guided meditation or playing Tibetan Singing Bowls (see “Reward Your Client with Tibetan Singing Bowls“), but peaceful relaxing music works well too. 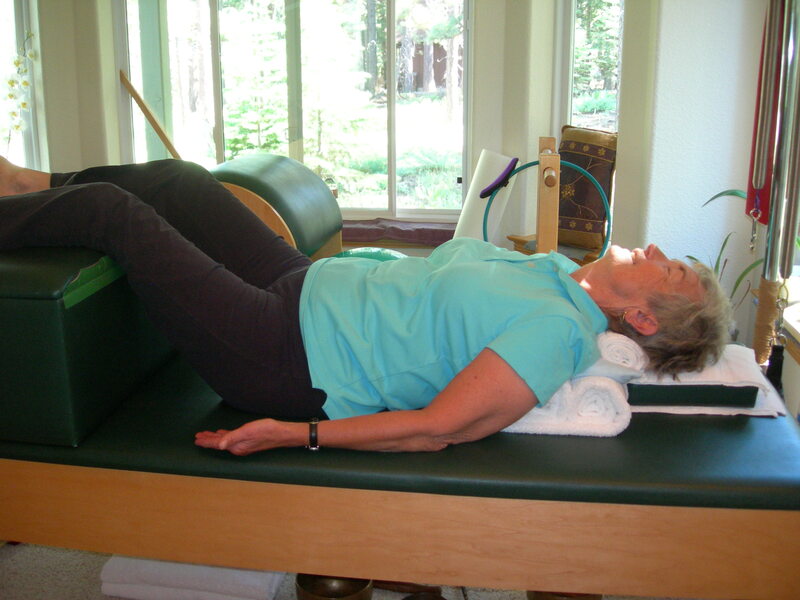 Consistent practice of restful thoracic extension using towels can counteract slumping posture and make it easier for your client to once again straighten up and sit right.